We’re bad guys, but we’re not THE bad guys! We were told that Captain’s Quarters was one of Escape Quest’s earliest rooms, and though our GM thought we’d be less impressed by this room due to this, we were still wowed by the great production value of this room. There was an exciting soundtrack playing to spur us along, and though this was our 3rd room in a row here, we were energized and excited to continue escaping! Though this was a strictly linear, Generation 1 room that included limited tech and mostly lock inputs, it fit the theme and remained an enjoyable escape. The room itself was comfortable for our group of 4, and could easily fit the maximum of 6, which is rare for escape rooms, I find. Props were convincing and enjoyable to work with, and puzzles connected well from one to the next. One particular teamwork puzzle was a fun surprise, and searching through the room turned up some entertaining hidden compartments. One thing I very much enjoyed about Escape Quest, was that they took the standard after escape photo inside of the room, using props you’ve found throughout, turning the usual memento into something a bit more exciting. Some players will be disappointed by the lack of technical items in the room, especially if they’ve recently played one of Escape Quest’s more technology heavy games. One entertaining teamwork puzzle was a bit more well hidden than felt necessary, but was fun once we’d found it. A couple props felt a bit off theme, but weren’t enough to break the immersion. Some puzzles I had seen before, and were, we were told, part of a prepurchased set, so there may be some repeats for Enthusiasts, though the puzzles were well done overall. The Captain’s Quarters is a fun experience, but is probably best suited for those new to the Escape Room hobby. Beginners will enjoy this as a low-tech introduction to escape rooms, but Enthusiasts will escape quickly, and may have a few repeats in puzzles. 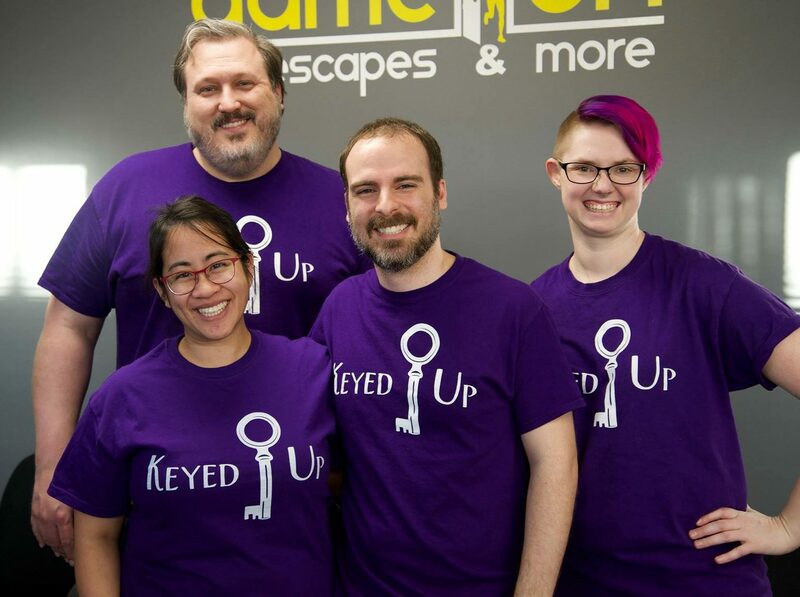 I recommend trying this one out if you’re into the theme or are introducing new players to Escape Rooms, but if you’re more experienced, check out the excellent Black Widow, King’s Ransom, or Lost Temple rooms at Escape Quest, which are newer, and should be more challenging for you! Book your heist in the Captain’s Quarters here!